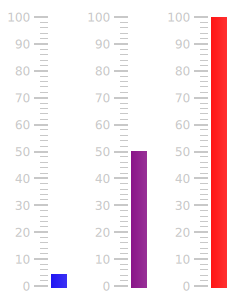 The gauge displaying values at various points during the animation. The background of the gauge, displayed behind the valueBar. By default, no background is defined. The Gauge that this style is attached to. The bar that represents the foreground of the gauge. This component is drawn above every other component. Each minor tickmark displayed by the gauge. To set the size of the minor tickmarks, specify an implicitWidth and implicitHeight. For layouting reasons, each minor tickmark should have the same implicitHeight. If different heights are needed for individual tickmarks, specify those heights in a child item of the component. readonly property int styleData.index The index of this minor tickmark. readonly property real styleData.value The value that this minor tickmark represents. readonly property real styleData.valuePosition The value that this minor tickmark represents as a position in pixels, with 0 being at the bottom of the gauge. Each tickmark displayed by the gauge. To set the size of the tickmarks, specify an implicitWidth and implicitHeight. The widest tickmark will determine the space set aside for all tickmarks. For this reason, the implicitWidth of each tickmark should be greater than or equal to that of each minor tickmark. If you need minor tickmarks to have greater widths than the major tickmarks, set the larger width in a child item of the minorTickmark component. For layouting reasons, each tickmark should have the same implicitHeight. If different heights are needed for individual tickmarks, specify those heights in a child item of the component. readonly property int styleData.index The index of this tickmark. readonly property real styleData.value The value that this tickmark represents. readonly property real styleData.valuePosition The value that this tickmark represents as a position in pixels, with 0 being at the bottom of the gauge. This defines the text of each tickmark label on the gauge. readonly property int styleData.index The index of this label. readonly property real styleData.value The value that this label represents. The bar that represents the value of the gauge. To height of the value bar is automatically resized according to value, and does not need to be specified. When a custom valueBar is defined, its implicitWidth property must be set. This property holds the value displayed by the gauge as a position in pixels. It is useful for custom styling.